Full disclosure: I like Criminal Minds. And no, it’s not just because FBI profiler Derek Morgan is sometimes shirtless and also often kicks down doors or flies through the air to take down the perps. I have to admit that I have a sick fascination with serial killers and their creepy-crawly minds. 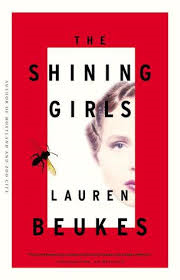 So Lauren Beukes novel The Shining Girls seemed like it might totally be up my dark alley (with the crazy person waiting at the end in the shadows.) This book was a recent purchase, never a guarantee that I am going to read it imminently, but – as it turns out – I did read it in short order. Was it a wholly satisfying experience? Um, no. However, I was still turning the pages way past my bedtime last night, so that’s saying something. Harper Curtis is a nondescript sort of guy, remarkable only for his limp. Oh, plus he’s a time-traveling serial killer. Why he is able to skip through time is never really explained, but how is a different story. There’s this House (yes, with a capital ‘H’) and Harper has the key. I’ll see you when you’re all grown up. Look out for me, okay, sweetheart? I’ll come back for you. Harper does come back for Kirby; he comes back for all his “shining girls.” Beukes gives us just enough of their stories to make us care about their awful, violent deaths. One by one, he picks them off, leaving mementos of another time with their ruined bodies. Harper doesn’t count on Kirby surviving, but she does. Now, years after her attempted murder, she’s determined to find the man who almost did her in. The thing is, since he’s able to move through time, he’s almost impossible to catch. The Shining Girls might be the sort of book that readers give up on because it’s too confusing or they don’t buy the time travel element of it. I was happy to go along for the ride, especially for the first three-quarters of the book or so. Harper wasn’t especially scary – we don’t really learn anything about him until about two-thirds of the way through the book – he’s pretty much a garden variety psychopath with a penchant for knives and intestines. What really kept me turning the pages was Kirby. She’s smart and resilient and determined. I liked her and I wanted her to be safe. Something happened, though, near the end of the book. The carefully sustained tension was somehow deflated. Kirby became that girl. You know, the one who chases after the killer all on her own and then goes into the House all on her own…without a weapon. It was more than that, though. (Seriously, I knew she had to chase after Harper and go into the house – what kind of ending would we have had if she hadn’t?) I think it was just that when all the pieces of Beukus’ intricate jigsaw puzzle were exposed it somehow seemed silly. Time heals all wounds. Wounds clot, eventually. The seams knit together. This entry was posted in Book Chat and tagged 2014, Book Review, thriller by Christie. Bookmark the permalink.